Just want to help you keep up with trends with your teens! 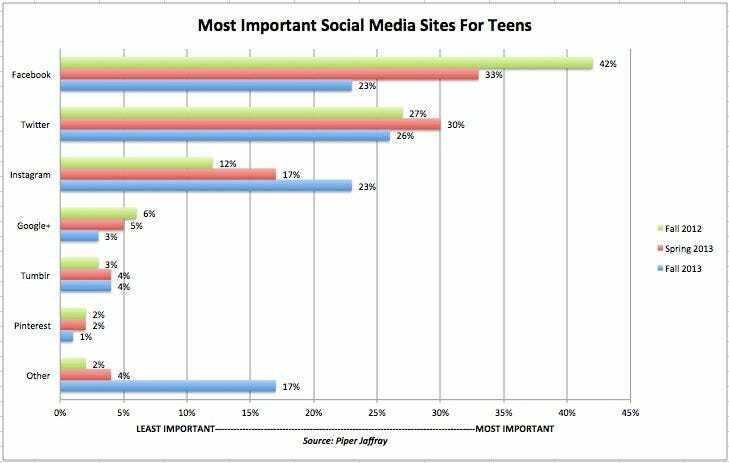 Twitter has overtaken Facebook as the social media network that is most important to teens, according to Piper Jaffray’s semi-annual teen market research report. But Twitter should not become complacent, the report suggests. That’s because Instagram has rocketed in popularity with teens. 23% said Facebook-owned Instagram was their No.1 choice, up from 12% a year ago. The maneuvering suggests Facebook was right to acquire Instagram as a backstop against losing younger users to competing, simpler networks. The reports are a contrast, but not a contradiction to, Facebook’s own statements on teen users. CEO Mark Zuckerberg has twice spoken publicly recently about whether teens are abandoning Facebook. In September, Zuckerberg said “coolness is done for us.” Previously, on his Q2 earnings call, Zuckerberg said that Facebook’s own research shows that teens are not abandoning the site. Facebook has, frustratingly, declined to share that research — even though investors would salivate over it. Two different sources inside Facebook tell Business Insider that there is a difference between what teens say about Facebook and how they actually use it. Sure, Facebook might be uncool — your mom is on it, after all — but it’s such a ubiquitous tool, and teens have huge social networks on it. “The typical (median) teen Facebook user has 300 friends , while the typical teen Twitter user has 79 followers,” Pew says. Make no mistake….nothing beats quality family time (face to face). So please have a nice Sunday dinner with your family. But I wanted to share this research so you can stay in tune with your teens – I hope someone does that for me when our 18 and 3 month old boys get to be teens! ← Let’s Share Some Good News – Foreclosures Continue to Decrease!